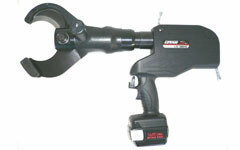 LIC-585YC Battery Operated Cutter Lithium Ion Tools: Izumi Products. NEW "Rapid Action". Cuts steel materials as ell as cables. New Environmentally friendly Lithium-ion battery - light weight - no memory effect. New Slide in battery insertion gives a more secure connection with the tool. The LIC-585YC has twin stage hydraulics for rapid ram advance. With the pull of the trigger, you can cut CCP Cables up to 85mm and Cu./Al cables up to 60mm. 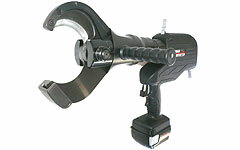 The LIC-S585YC has an overload bypass, which will "kick out" when the tool reaches 7 tons of output.